KUCHING: While pleased with Sarawak’s 2-1 season opening victory over Perlis, head coach Robert Alberts has his hands full in addressing the team’s shortcomings. He has told his players to buckle up for the coming battles. Specifically, Alberts lamented on the team’s lacking in possession and the players being caught off guard when their opponents dictated the pace of the game. Although the Crocs managed to cancelled the northern state’s lead through the goal by their new hitman Ivan Babic, it was Perlis who had shown more urgency to win the game with their marauding attacks. “I am not satisfied with them (players), they’re not good enough to control the match. Often we were too slow in reacting to counter attacks. These are the situations that need to be addressed,” said the Dutchman when contacted yesterday. Alberts added that he also unhappy with the sending off of defender, Ramesh Lai Ban Huat for a second bookable offence in the final stages of the game. He said that with 10 men, it was difficult for the players to maintain their composure and hold on to the lead. Ramesh will miss the next game against UiTM at Stadium Negeri on Friday. When asked to comment on Friday’s game, Alberts warned that UiTM is a good team to be reckoned with. He mentioned that the match cannot be taken lightly in view of the UiTM’s impressive set of players. “We cannot look down on UiTM…it is the team that represented Malaysia in the University Games in Laos last December. They have a few good players. 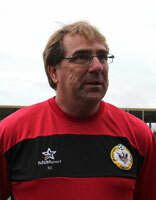 Even though they lost to Kedah last night, do bear in mind that it was not easy for Kedah to beat them,” Alberts said. Hopes are high among the local fans who expect Sarawak to continue their winning form and eventually win automatic promotion to the Malaysian Super League (MSL) at the end of the campaign. The return of prodigal son Lucas Kallang Tie and crowd favourite Bobby Gonzales from Sabah has raised their optimism. Although it is still too early to determine Babic’s true potential, the Croatian had impressed fans in the friendly matches that he played so far. Team captain Guy Bwele is settling down well into his new central defensive role. However, fans are calling for the Cameroonian to return to the central midfield role which he had excelled in last season. Newly promoted players Muhammad Dzulfadli Awang Marajeh and Dalglish Papin Test are among the new faces to watch and they are expected to gain valuable experience with their inclusion in the senior squad. New local imports Ahmad Aminuddin Shaharuddin from KL Felda United and former Sabah players Mafry Balang and Ronny Harun will need to settle down quickly with the rest of their team to boost the Crocs’ challenge in the Premier League.